Stir together miso and 1 Tbsp butter. Discard turnip stems but reserve and coarsely chop the leaves. Halve the larger turnips and leave the smaller ones whole and put into a skillet with the water, mirin, 1/2 Tbsp butter, and pinch (1/16 tsp) of salt. Bring to a boil then simmer, covered, for 4-5 minutes. Add the turnip greens by the handful, turning and stirring with tongs, and adding more as the volume of greens reduces. 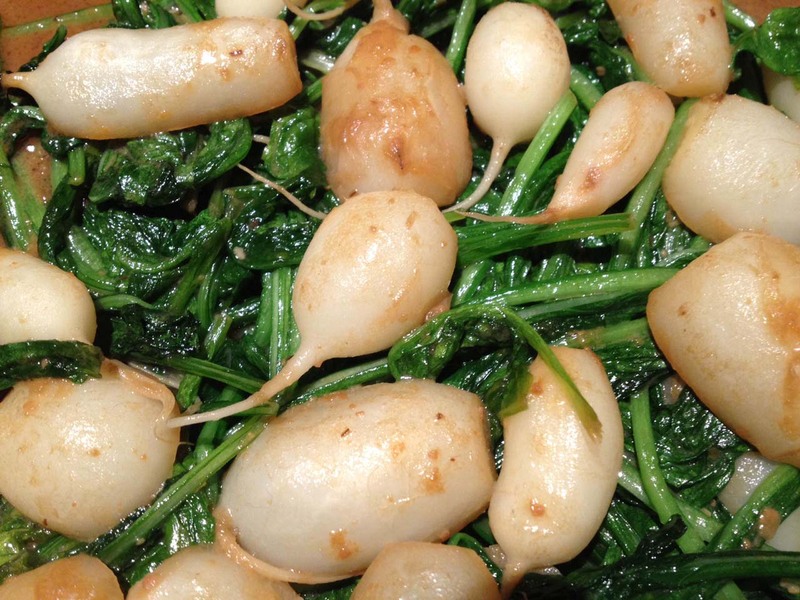 Cook for one minute, then remove and reserve greens and turnips. Stir the miso butter into the residual liquid and continue to simmer until it reduces to a glaze, about 5 minutes. Add more water if necessary to thin. Taste, and adjust with salt if necessary. Plate the turnips and greens and pour the glaze over.